Gardenia Flowers have an uncanny way of reminding us of our loved ones and filling our hearts with appreciation for them. 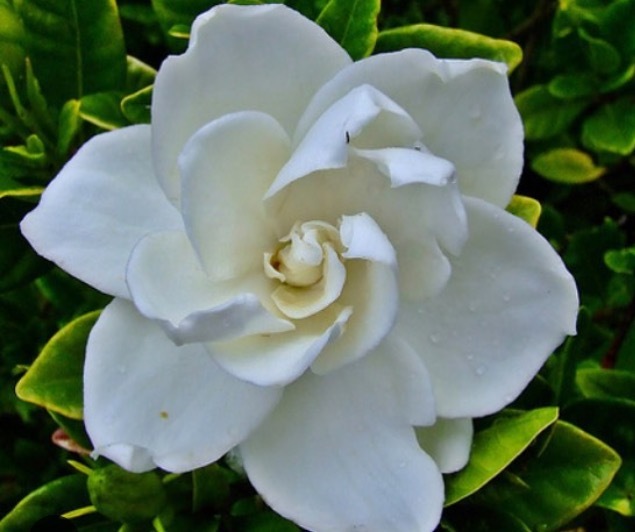 Since I have been writing and posting about Gardenia, I have been receiving messages from family members describing their connection with this flower and how it reminds them of their mothers. “I love Gardenias. My mother loved this flower”. Gardenia is a treasured flower among many! Why do we have this connection to Gardenia? Beyond its powerfully sweet and spicy fragrance and stunning beauty, Gardenia has much to offer humanity with its vibrations of grace and purity. When I first started talking to Gardenia, her presence helped me to feel really awake and present in the moment with her. She illuminated the many layers of her petals, the path between them to her center, how she blossoms generously and in her own time with her own unique presentation. I had been feeling shy, wanting to share more of myself but feeling the tightness of my petals still hugging me into a protective cocoon. I felt a deep sense of acceptance and graciousness within, towards myself and others. All will blossom in time, in a most exquisite fashion. Over time, my heart-mind led me to Gardenia to consult with her on various “assignments” and I got to learn more about her medicine. One aspect of a flower’s medicine is the primordial wisdom it reflects about creation and being here on Earth. Gardenia’s reflections showed a web of patterns, relating back to our earliest relations and continuing into our present relationships and beyond. She also demonstrated the free will that we are gifted with. We choose the patterns we repeat and the web we weave. Naturally, when we are consciously choosing, we choose to illuminate and repeat the loving patterns. We choose love every time. Gardenia Plant Spirit Medicine helps us to drop into the present moment. As we offer our presence, we see things for how they truly are. With presence in the here and now, we have a fresh perspective that allows us to relate to others in a way that is clear and free of habitual thinking. As we relate to new people in our lives, with our presence in the now, we build relationships that honor God and follow the loving patterns we were raised with. We forgive those patterns that were followed out of habit, karma, and unawareness. Being present in the moment is an act of grace that can be truly healing. It indicates that we are aware of our freedom, and this sets others free as well. When we set another free, we provide a space for them to show us who they are. As dynamic beings on an ever changing planet, we are subject to constant change as well. Clearing our minds of preset notions (even if based on past experiences) allows new pathways to flow forth each time. The pathway ultimately leads to our own heart, and that of the other person. And in that space, timeless, infinite love is present. This is the true gift of family: to provide this space of safety and unconditional love that is so conducive to growth, and inevitably, change! Gardenia’s graceful vibrations help members of a family to hold in their hearts this deep, true love, and to see, accept and support one another through the many changes they will each undergo in their lifetime. As such, Gardenia often becomes a plant spirit ally for the entire family. When one person embodies her healing wisdom, it creates waves through the entire web! Gardenias remind us to slow down, be still, and enjoy the beauty of life! Gardenia flower essence is indicated for quieting the mind, grounding the body, and encouraging a feeling of inner peace. Connecting with Gardenia is helpful for meditation and prayer, as her white color and generous blossom remind us to open our hearts and connect with Spirit. Gardenia Flowers help to attune our heart and crown chakras. I’m blessed from this post. Our gardenia just bloomed today and my dad brought in one of it’s beautiful gifts.